The Rainbow Lorikeet Trichoglossus haematodus is a truly stunning bird. It inhabits rainforests and coastal woodlands in parts of Australia, Tasmania, Indonesia, Papua New Guinea, New Caledonia and some other south Pacific islands. They are fairly small parrots, around 25–30 cm in size with a wingspan of about 17 cm. Once one is in the right place, they are quite easy birds to observe and even photograph as they will frequent campsites and gardens. In Australia good places to see them include the Currumbin Wildlife Sanctuary in Queensland, where thousands often gather to feed and roost. 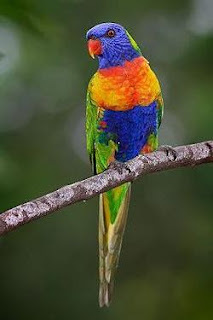 Unlike many parrots, over most of its range the Rainbow Lorikeet is not endangered.